While these exact strings are no longer available, Luxilon Savage strings come in many other colors! Happy reading! 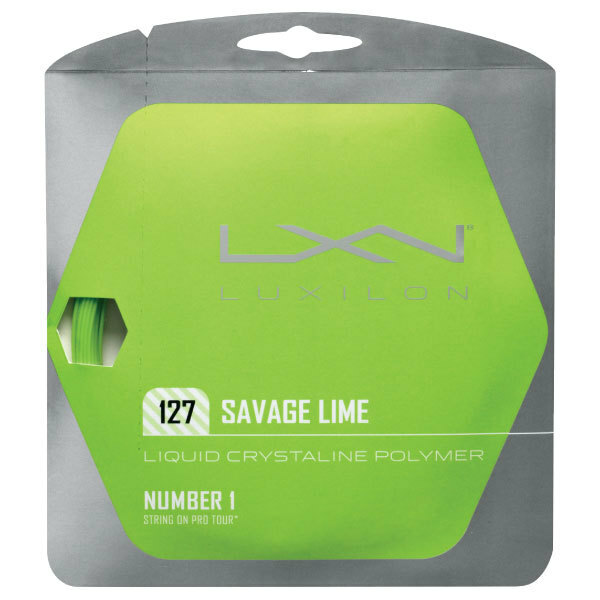 Savage lime features a hexagonal shape, which bites into the ball and creates exceptional spin potential. The liquid crystalline polymer composition provides good control without powering the ball long. Savage is great for players such as aggressive baseliners, who are able to provide more of their own power. When it comes to power, Savage won’t knock your socks off. It remains more composed, allowing the player to swing out on the ball and trust that the string can generate enough spin to keep the ball in play. Savage’s hexagonal shape allows you to create a lot of spin. While hitting with the string, I felt a sense of confidence that other strings haven’t offered. It really allowed me to hit through my shots and dominate points from the baseline without worrying about the ball going long. Because the string isn’t as lively as other polyesters, you won’t get the unpredictability that can be associated with them. Savage provides great feel compared to other polys, which can feel mushy or numb. With Savage you can feel what the ball is doing on the strings, which allows you to feel in control of your shot choices. Drop shots and other touch shots are a pleasure to hit since you can feel everything happening. Savage provides slightly better than average durability, which lasts for two weeks and about 20-25 hours of intense play. Throughout the life of the string it played without diminishing spin or feel. Until the moment the string broke, it played like the very first time after I had the racquet strung. Overall the string was very pleasing to play with. It offered great feel, plenty of spin and consistent play. All of these features together offer a confident, inspiring string that best suits players, such as aggressive baseliners, who can generate their own power. About the Reviewer: Aaron Dial is a graduate of the Professional Tennis Management Program at Ferris State University in Michigan. He is also a certified USPTA Professional.